Prosecutors: Boston Marathon Bomb Suspect 'Readily Admitted' Guilt : The Two-Way Prosecutors revealed new details about the bombs that exploded at the marathon finish line in April 2013, defending FBI questioning of Dzhokhar Tsarnaev as he recovered from gunshot wounds. Prosecutors released new details about the Boston Marathon bombing in a court filing Wednesday. They released the full text of a note that suspect Dzhokhar Tsarnaev wrote while hiding out and detailed the mechanisms used to detonate the bombs that killed three people and injured more than 260 others on April 15, 2013. "From the moment the agents began questioning Tsarnaev about the Marathon bombings, he readily admitted his own involvement," U.S. Attorney Carmen Ortiz and his assistants wrote. 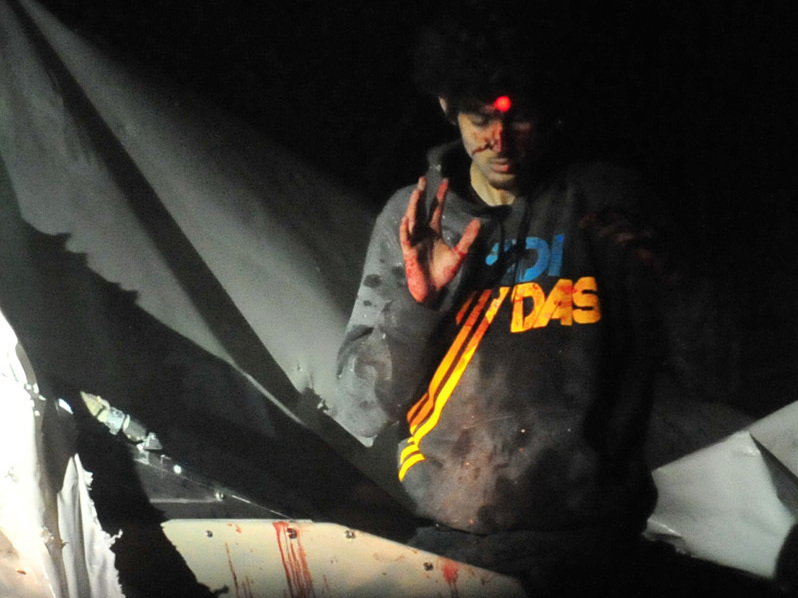 Boston bombings suspect Dzhokhar Tsarnaev on April 19, 2013, as he emerged from a boat stored in a Watertown, Mass., backyard. The red dot of a police sharpshooter's laser sight can be seen on his forehead. The 29-page court document was filed in response to a defense motion to suppress statements Tsarnaev made during hours of questioning while he recovered at Beth Israel Deaconess Medical Center. Tsarnaev was captured in a boat in a suburban backyard following a massive manhunt that shut down much of the Boston area. The FBI wanted to question him quickly for fear he and his brother, Tamerlan, who had already been killed in a shootout with police, had not acted alone. In the filing, prosecutors also described how the bombs were made. "The marathon bombs were constructed using improvised fuses made from Christmas lights and improvised, remote-control detonators fashioned from model car parts," the prosecution team wrote. "These relatively sophisticated devices would have been difficult for the Tsarnaevs to fabricate successfully without training or assistance from others." Tsarnaev had smashed both his cellphones before getting in the boat, "basic elements of apparent terrorist tradecraft" that suggested "training and direction from a terrorist group," prosecutors contend. Their filing quotes in full a note he wrote while in the boat. "God has a plan for each person. Mine was to hide in this boat and shed some light on our actions," Tsarnaev wrote. "We Muslims are one body, you hurt one you hurt us all." Despite their defense of the FBI's questioning of Tsarnaev, prosecutors say the suspect's statements will not be needed to make their case. "The strength of the evidence against Tsarnaev, which includes the confession he wrote on the inside of the boat, makes affirmative use of the Beth Israel statements unnecessary," the prosecution's filing states. A status conference on the case is scheduled for next month, with a jury trial set to begin in November. Prosecutors are seeking the death penalty.